Posted on October 23, 2014 by Staff & filed under Nevada by the Numbers Blog. RCG Economics and the UNLV LIED Institute for Real Estate Studies are happy to present the results of our Las Vegas Valley Quarterly Commercial Surveys and industrial market research for the third quarter of 2014. It was a good quarter for all three major markets (Industrial, Speculative Office and Anchored Retail). All markets saw a decrease in vacancy rates, while the Industrial and Commercial markets also saw an increase in asking rents. Below is a summary of our findings. The Valley’s average industrial vacancy rate plunged by four percentage points from 12.6% in Q3, 2013 to 8.6% in Q3, 2014. The Valley’s average monthly asking rent jumped by nearly 18% from $.51 psf in Q3, 2013 to $.60 psf in Q3, 2014. The R&D/Flex subtype has the highest vacancy rate at 18.3%. The Henderson submarket has the lowest vacancy rate at 6.0%. The Northwest submarket has the highest vacancy rate at 13.1%. 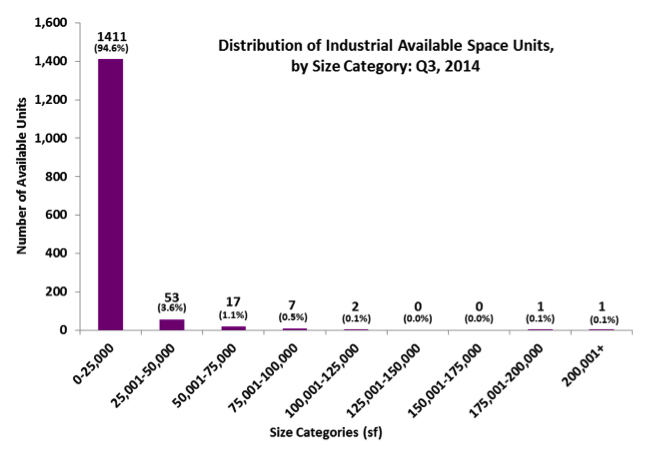 The monthly asking rent for Industrial space increased by $0.02/sf since Q2, 2014. The Warehouse/Distribution subtype is surging, with a vacancy rate that has dropped 5.7 percentage-points in the last year. Warehouse/Distribution has 3,181,300 square feet (“sf”) of new space under construction or in planning, making up 93% of all Industrial space in development. The Las Vegas Valley’s industrial market is now firmly on the recovery road with a vacancy rate below 10%. 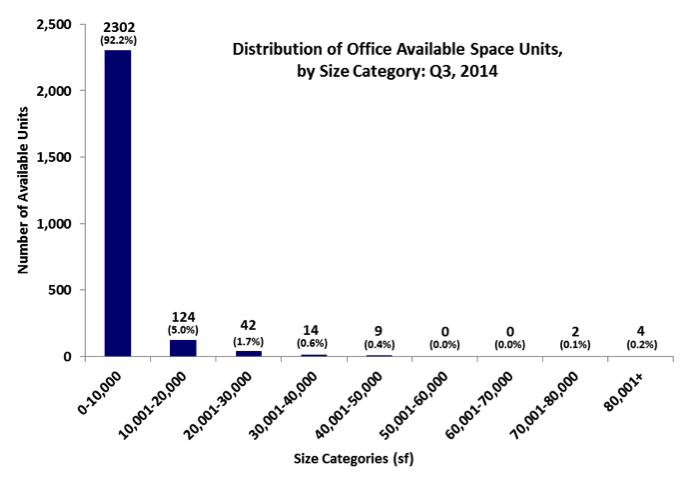 The Valley’s average spec office vacancy rate dropped by 3.5 percentage points from 24.9% in Q3, 2013 to 21.4% in Q3, 2014. The Valley’s average monthly asking rent stayed relatively stable, from $1.87 psf in Q3, 2013 to $1.88 psf in Q3, 2014. The Class A market has the highest vacancy rate at 30.3%. The North Las Vegas submarket has the lowest vacancy rate at 14.9%. The East Las Vegas submarket has the highest vacancy rate at 23.3%. The West Central submarket remains the least expensive at a monthly rent of $1.33/sf. Class C space is leading the downward charge in vacancy rates. The rate dropped by 5.4 percentage-points since last year and 2.3 percentage-points since last quarter. Generally, vacancy rates in all subtypes and submarkets have improved over the last year. The Las Vegas Valley has 6.5 years of supply of speculative office space remaining to reach the 10% stabilized vacancy rate, based on the 40-quarter (10-year) average absorption rate. The Valley’s average anchored retail vacancy rate dropped by 1.4 percentage points from 12.4% in Q3, 2013 to 11% in Q3, 2014. The Valley’s average monthly asking rent declined slightly from $1.30 psf in Q3, 2013 to $1.22 psf in Q3, 2014. The Community Centers had the lowest vacancy rate at 9.3%. The Northeast submarket has the lowest vacancy rate at 5.6%. The North Las Vegas submarket has the highest vacancy rate at 13.6%. Vacancy in Power Centers worsened 2.1 percentage-points since last quarter. The Las Vegas Valley has about 1 year of supply of anchored retail space remaining to reach the 10% stabilized vacancy rate, based on the 40-quarter (10-year) average absorption rate. Asking rents for Anchored Retail space is volatile, having alternated between an increase and decrease each quarter for the last three quarters.